Companion Animal Hospital Blog: Yellow Vomit... Yuck! Do you sometimes wake in the morning to find a spot of yellow vomit on your floors or carpet left by your dog, yet find your dog does not appear ill and will readily eat his morning meal with no further vomiting problems? The yellow vomit is actually bile, produced in the liver, which backflows into your dog’s stomach and mildly irritates the stomach lining to cause vomiting. It is called bilious vomiting syndrome and in most cases, can be easily prevented. To understand why this vomiting occurs it’s important to know how things work in the upper digestive tract. Bile is normally produced in the liver and transported to the intestines via the bile duct to aid in digestion. Peristalsis is the normal coordinated contractions of the esophagus, stomach and intestines that works to move food from the mouth, through the stomach and intestines and out the back end. This peristalsis is what allows you to successfully drink water while standing on your head! These dogs that vomit yellow fluid are presumed to have a digestive motility disorder. 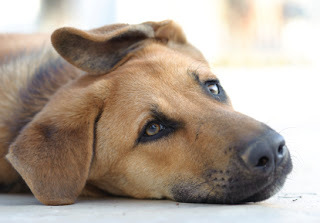 In these dogs, when there is not the stimulus of food in the stomach or upper intestines, peristalsis seems to stop. It is the peristalsis that moves the bile deposited into the intestines to move down the intestinal tract away from the stomach. When it has been a while since the dog’s last meal, the stomach and intestinal tract are empty and peristalsis stops. When this happens the bile tends to accumulate and pool in the upper intestines, then leak backwards into the stomach. The bile in the stomach will cause a dog to vomit the yellow liquid. Most times you can correct this problem by feeding your dog smaller but more frequent meals so that there is always some food in the upper digestive tract to maintain normal peristalsis. You will find that bilious vomiting occurs long after your dog had his last meal. If increasing frequency of feedings does not help, talk to your vet about medications to aid in promoting proper digestive tract motility. One important thing for any dog suffering from any kind of joint issues is weight management.Weight management and carefully designed exercise regime can go a long way to improve quality of life for a dog with arthritis.Supplements also play a major role in treating your dog suffering from arthritis. Petbounce is one such supplement that is a natural pain relief for dogs.